All about crime-solving and mystery games! For PC, Mac, console and mobile. For ardent Cluedo fans, find out below how you can play the classic Clue board game on your PC or Mac. With this computer version you can play the Clue game against computer opponents. And unlike the online game, you have unlimited investigations to find out whodunnit, just like the original Cluedo board game. I've included details of the computer game, screen shots as well as how this compares with the Clue board game. 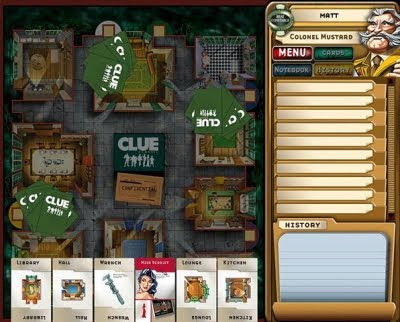 The Clue board game is the original of the mystery detective games, everyone has played this board game of deduction and elimination. And this computer version uses the same rules and layout as the board game but it also has many useful features and stunning visual additions. All this makes this a great choice for fans of detective games. 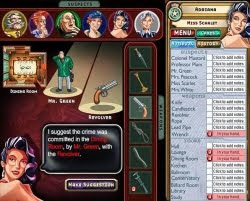 Atmosphere: with sound effects and background music this computer version of the Clue game has all the right atmosphere of suspense and murder mystery! Want a quick Clue game? If you are in hurry and don't wait for the computer players turns, you can speed them up by holding down the space bar - a bonus over real-world Cluedo! You can save a game, and reload it later, picking up the game where you left off. The game's interface is well designed and easy to use. It also includes a history panel and a detective's notebook. The faster you solve each investigation the better your detective ranking becomes and you earn detective badges. And another great bonus is that if you decide you are in a position to make an accusation and then find you are incorrect, all you get is to miss a go. Again, unlike in the real Clue boardgame where you are out of the game completely. * Classic Clue for PC. * Classic Clue for Mac. For details of the new official Hasbro Clue game for mobiles. See my updated blog post: Play Clue aka Cluedo on iPad and iPhone! * Play Cluedo aka Clue Online Free. * Mystery PI Games List. * James Patterson Womens Murder Club Games List. All about the Clue board game. My page on all things Clue! Including lists of the classic Cluedo characters, rooms & weapons. 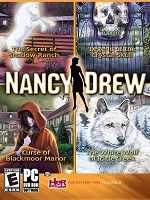 Cool Nancy Drew 4-in-1 Games Bundle from Amazon! Includes Curse of Blackmoor Manor, Secret of Shadow Ranch, White Wolf of Icicle Creek and Legend of Crystal Skull! © 2009-2019 Top Mystery Detective Games. Awesome Inc. theme. Theme images by enjoynz. Powered by Blogger.